With Areotek USB-C to Ethernet adapter, you can easily connect your USB Type-C device to a router, modem, or network switch to deliver Gigabit Ethernet to your network connection. The adapter instantly bridges the gap. Simply insert the adapter's USB connector into your device's USB port and connect your Ethernet cable to the Ethernet port on the other end of the adapter. The USB-C male to RJ45 female adapter supports 10/100/1000 Ethernet at USB Type-C speeds (1000Mbs), which is faster than 10/100 adapters and most wireless connections. The USB C to Ethernet Adapter is the good ideal solution for connecting a computer without an Ethernet RJ45 port. Wired connections provide faster data transfers and better security than Wi-Fi. 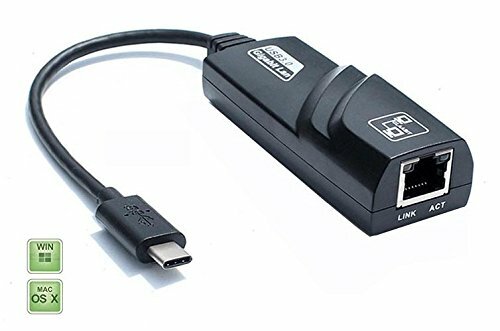 This USB-C Ethernet adapter support a reliable network connection with 10/100/1000 Mbps Ethernet. You don't need to wait for loading and buffering WIFI, a quick and simple Ethernet connection gives you access to speeds up to 1 Gbps. Plug and Play. No CD or external software drivers are required. Also the USB-C to Ethernet adapter does not require an external power adapter. USB-C to Ethernet Compatible with 2017 Macbook Pro, 2016 MacBook, 2015Macbook, Google Chromebook Pixel, ASUS ZenBook Pro, Lenovo ThinkPad P50 / P70, Lenovo Yoga 900 13, Dell XPS 15, Samsung Notebook 9, Samsung Galaxy S8 and more USB-C device. Supports IPv4/IPv6 protocols, dual channel transfer mode, automatic transfer and data stream reversing regulation. If you have any questions about this product by Areotek, contact us by completing and submitting the form below. If you are looking for a specif part number, please include it with your message.